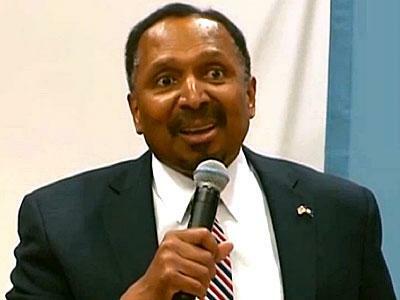 By praising Jenner for her courage in coming out, President Obama is betraying Christian values, claims the minister and former political candidate. E.W. Jackson, the right-wing minister who ran unsuccessfully for Virginia lieutenant governor in 2013, has added to his litany of homophobic and transphobic comments by calling Caitlyn Jenner “insane” and denouncing President Obama for lauding Jenner’s courage. Jackson’s latest remarks came Tuesday, in the National Emergency Coalition conference call his organization, Stand, hosts weekly. To the coalition, the progress toward LGBT equality is apparently an emergency, a raging fire to be put out. During his campaign in Virginia, Jackson’s history of antigay comments often made news; video and audio surfaced of him saying the repeal of “don’t ask, don’t tell” turned the U.S. military into “the equivalent of Sodom and Gomorrah” and that gay people were “sick” and “perverted.” He at times denied making the comments, even though they had been recorded, or said they were taken out of context. Listen to Jackson’s rant on Jenner below, courtesy of Right Wing Watch.